Celebrating 40 years of diversified horse-powered family farming. The Jay and Janet Bailey family have been farming a 40 acre horse powered, diversified farm using 1,2,3&4 horse hitches since 1980. 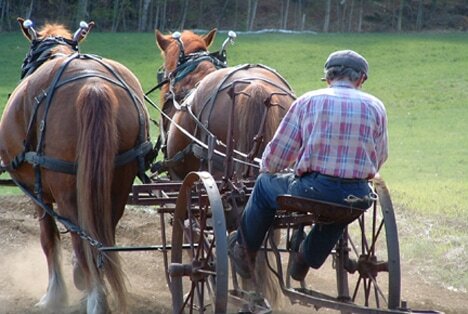 Located in Southern Vermont, we offer hay and sleigh rides and teach draft horse workshops with our Suffolk Punch horses. Jay puts some of his creative energy into rebuilding horse drawn mowing machines for sale, as well as servicing machines in use and needing a bit of R&R. We also provide our local community with fresh eggs from chickens fed organic grain. We have worked with the horses throughout the years and enjoy sharing our experience with others.